Vodka Cranberry cocktail with fresh cranberries. Cranberries are simmered with maple syrup, cinnamon, and nutmeg then is muddled with mint, vodka, Cointreau, then topped with sparkling water. Every good party needs that wow factor – the one that has guests talking the next day. It doesn’t need to be complicated. It can be as simple as taking a good party to a great party by adding a signature cocktail to your menu, such as this easy Cranberry Spritzer. Fresh cranberries are simmered with maple syrup, cinnamon, and nutmeg, for a fresh cranberry base that is muddled with mint, vodka, and Cointreau, then topped with ice and sparkling water. Garnish with some fresh cranberries and fresh mint, and get ready for happy guests! Bring cranberries, maple syrup, cinnamon and nutmeg to a simmer in a medium-sized pot. Place about 2-3 TBSP of the cranberry mixture into each copper mug or glass. Garnish with fresh cranberries and a mint leaf. Vodka Cranberry Cocktail Spritzer can be served with or without alcohol and is just the touch you need at your next bridal shower, baby shower, holiday party, or luncheon. 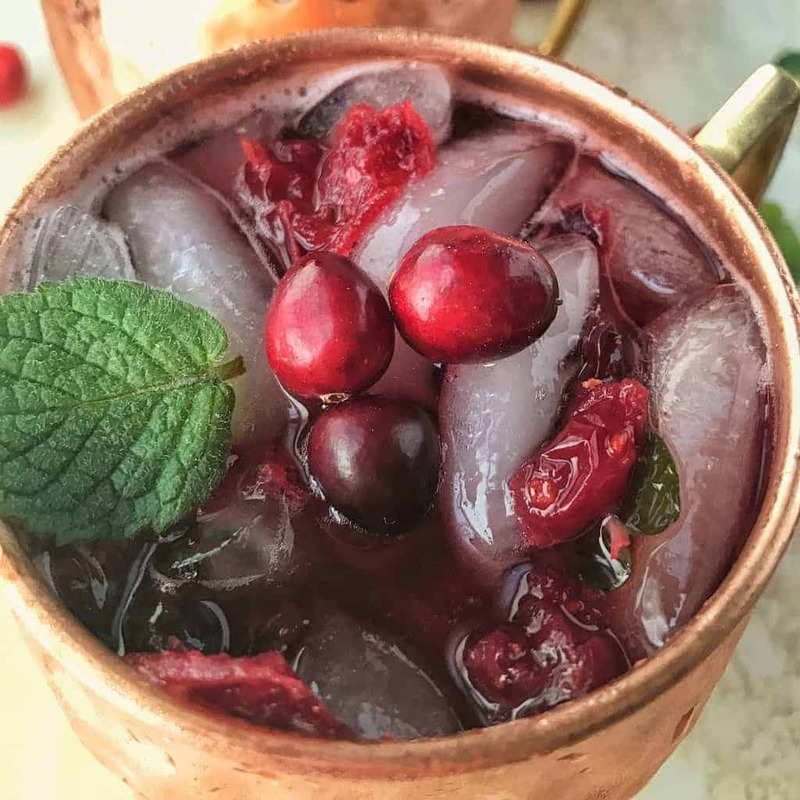 While you don’t need to serve this vodka cranberry in a copper mug, they do look festive and keep drinks super cold. Find my favorite copper mugs here. Vodka Cranberry cocktail, perfect for parties. Fresh cranberries simmer with maple syrup, cinnamon, and nutmeg and then are muddled with mint, vodka, and Cointreau then topped with ice and sparkling water for the perfect, light and refreshing beverage. For a sweeter drink, add a splash of cranberry juice or use 7-up instead of sparkling water. If you purchase through any links I get a small percentage paid by Amazon. It helps offset costs. I am going to try the non alcoholic version. Amazing to use cranberries. Love the tangy sweetness. Thanks Roxana. It is a great favor combo, I hope you enjoy! This looks like the perfect holiday cocktail!! This is such a pretty holiday drink! These photos are gorgeous! I love the “cocktail” option (and of course that it’s low-cal)!